When you had turkey Jordy paid attention, very close attention! 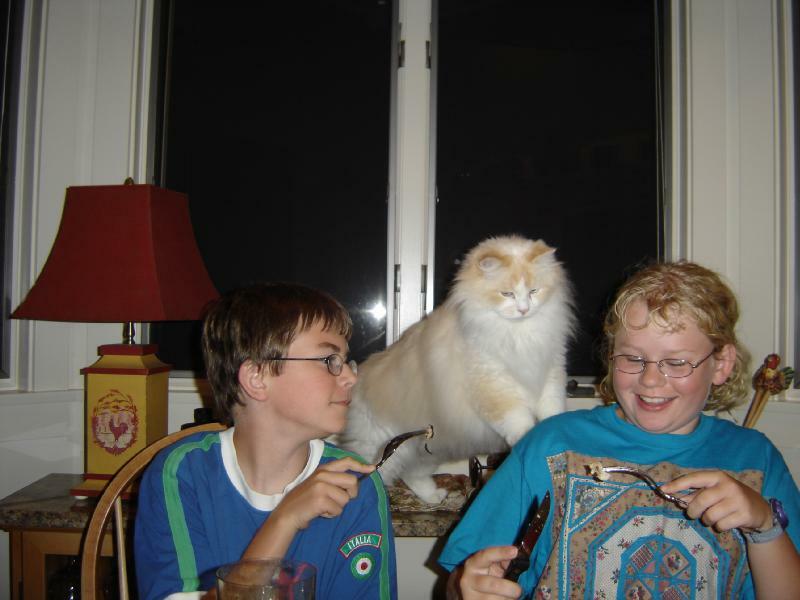 My best friend Carole had two ragdoll cats, Jordy and Kimi, siblings whom she adopted after their owner died 11 years ago. 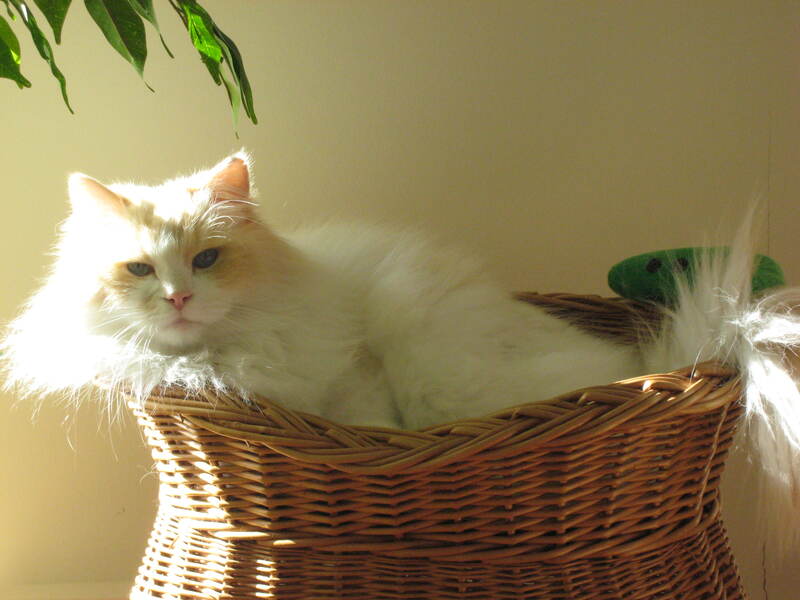 Recently, Jordy passed away after an arduous 4-year battle (for both cat and mistress) with severe colitis. His colitis wore him down. It wore him out. I cried when I found out. Fun in the sun means something a little different to a ragdoll than a Siamese! After Jordy relocated (with Carole and Kimi) to Maine I saw him less often. And I think he missed me! When I visited him (and Carole and Kimi, of course) in Maine he was my faithful buddy, following me around and keeping me company on my bed late into the night. I was in cat fur heaven. 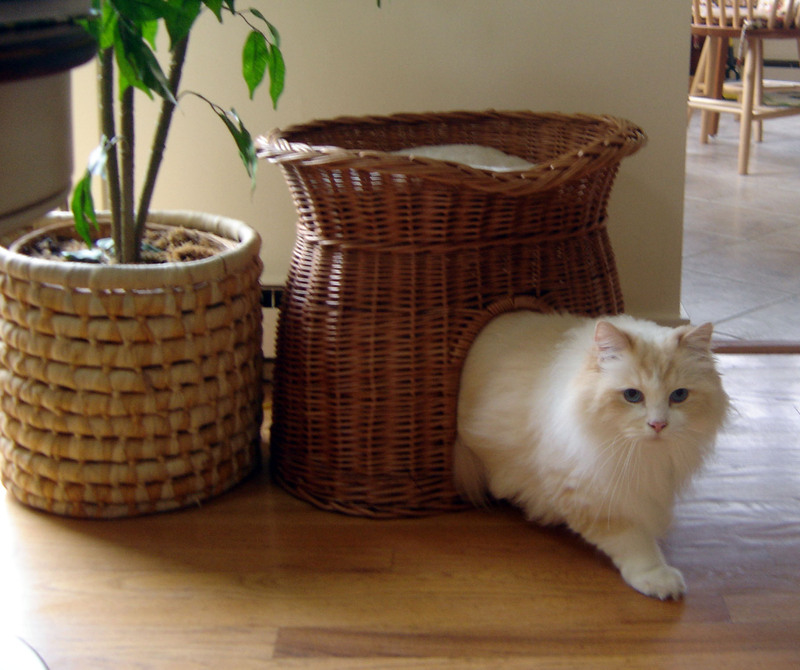 If you’ve ever known a ragdoll, you’ll know exactly what I mean. I was, literally, covered in fur when he was around! I couldn’t resist sneaking up on that big boy, lifting him for a hug, then quickly putting him down before he got really mad at me. 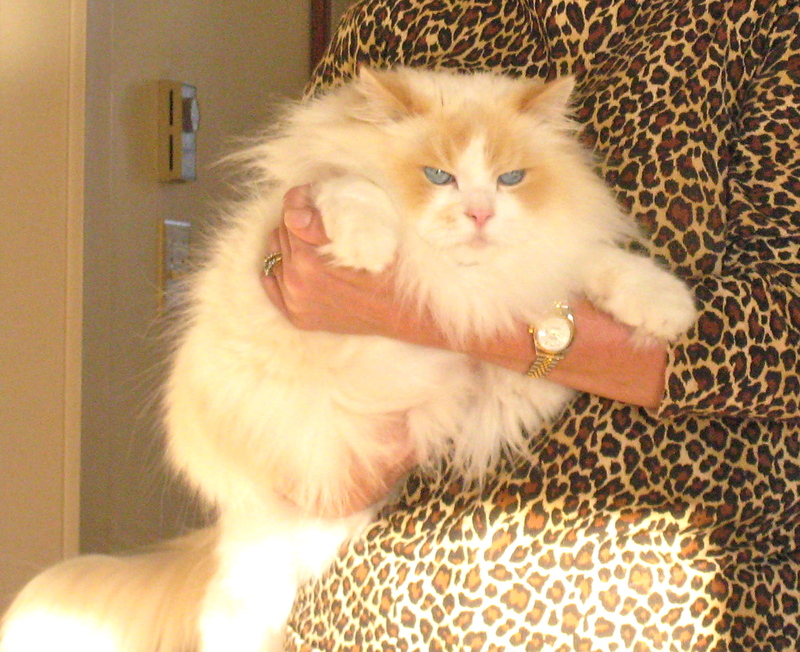 Jordy, old Mr. Dignified, would get so ruffled when I scooped him up like that; his mistress didn’t handle him that way at all! Can you tell I just did a scoop and hug? Look at Jordy's expression. Priceless! Jordy would let me pet his huge gorgeous head and ears. 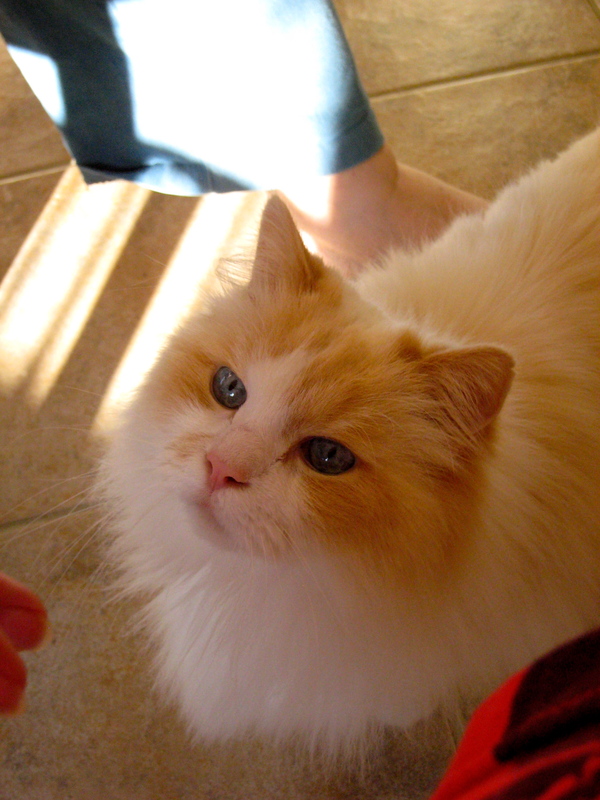 His caramel and cream fur would catch the light and sparkle as his icy blue eyes squeezed shut in pleasure. His purr, the biggest one I’ve every heard, would start low and gain in volume. I think Jordy sometimes forgot to be Mr. Dignified when he was around me. He would play like he meant it: eyes narrowed, whiskers twitching, big round fluffy paws kneading the carpet before he would P o u n c e! Then he’d sit back, shake his head, and become Mr. Dignified again. 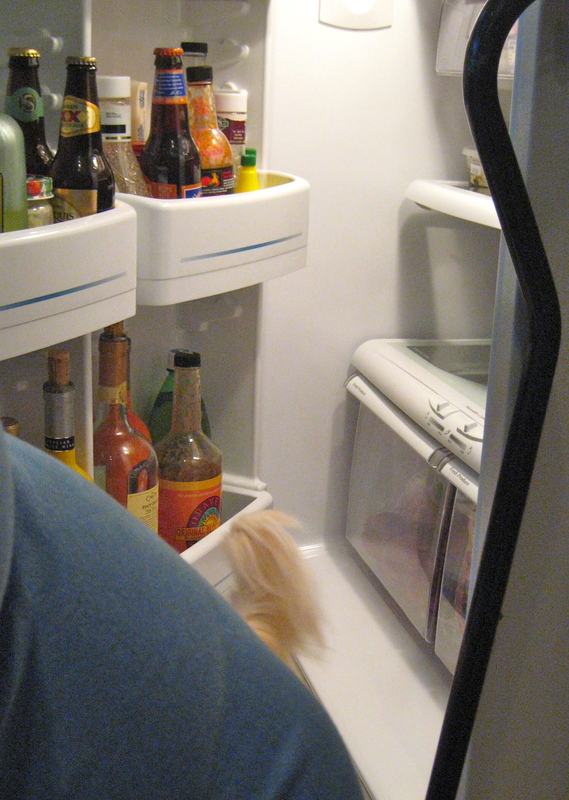 When the refrigerator door opened Jordy was right next to it! Turkey? Did someone say they have turkey?! Jordy, faithful companion and good friend. I’m sorry to hear about his passing. Cats are wonderful companions, and they really know how to get into your heart. thank you for this amazing tribute to our mutual friend. I had forgotten that you had all these great pictures of him when he was healthy….and you made no bones about the fact that you shamelessly favored him over his sister. He knew it and took full advantage of his privileged position in your affections…..as do I. Bless you. Jordy was regal, dignified and loyal, so loyal to his people. I found him to be endlessly fascinating and fun. Good cat companions are hard to find, but Jordy was a winner! Hugs, my friend. Hugs.